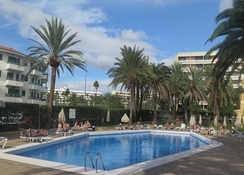 Book yourselves a stay at the classy and elegant Jardin Del Atlantico in bustling Playa del Ingles. At just four minutes on foot from the beach, this property features an outdoor playground surrounded by lush green palm trees. 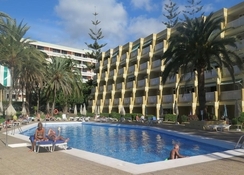 The hotel offers a buffet restaurant on-site and an amazing poolside bar. A miniature golf course here can be called as the prime attraction of the property. Guests can browse their emails and connect with their friends with the help of free Wi-Fi available at the reception area. 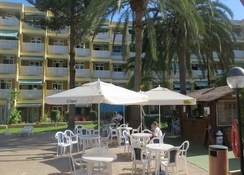 A plethora of shops, eateries and restaurants are located within close proximity of the Jardin Del Atlantico. A children’s playground keeps your children busy. Playa del Ingles, located southernmost tip of Gran Canaria, is a custom-made resort for unlimited fun in the sun. Its large sandy beach is popular among travellers with families and has thrilling water sports options. A lovely promenade is perfect for those long strolls along the beach. The evenings sizzle with many of the big name nightclubs, cafes and restaurants throbbing with sizzling excitement. 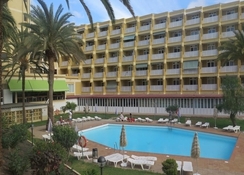 The Jardin Del Atlantico hotel is a lovely property located at 200 meters from the Playa Del Ingles Beach on the south coast of Gran Canaria. 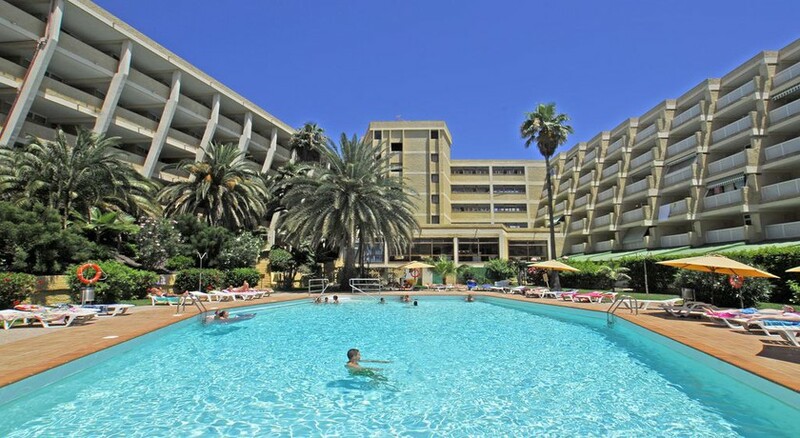 Maspalomas Golf Course is 2km from here and the hotel is at a 15-minute drive from the Gran Canaria Airport. 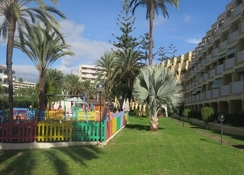 The apartments at Jardin Del Atlantico here are equipped with a private balcony, kitchen, private bathroom and a living-dining room with a sofa bed along with a flat-screen TV. The tiled flooring and the pine furniture adds oodles of class and style to the décor uplifting your mood. There are gorgeous views of the shore from the balcony. The apartments are furnished with a fully-equipped kitchen to enable guests to cook their own food. On the food front, Jardin Del Atlantico serves delectable dishes in its own buffet restaurant. Guests can laze around and relax with some heady drinks from the poolside bar. Plenty of eateries and bars are also located just outside the hotel giving guests a lot of options to sample different cuisines. The children’s pool located outdoors keeps your kids excited and happy. 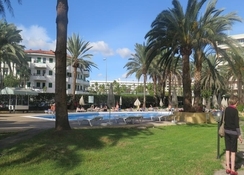 The adult pool surrounded by lush and tall green palm trees is a sight to behold. It not only oozes of style and luxury but also soothes your mind and body. Guests can just lay at the pool and enjoy some poolside drinks from the poolside bar. A miniature golf course located in the property keeps the golfers entertained. A well-manicured tennis court enables one to polish their tennis skills.